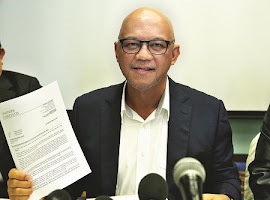 Contrary to his earlier statement, Consortium Zenith BUCG Sdn Bhd (CZBUCG) chairman Datuk Zarul Ahmad Mohd Zulkifli (pictured) yesterday said the Penang government did not order the company to halt the feasibility study on the Penang-Butterworth undersea tunnel. Zarul Ahmad said his statement on Tuesday, made at a Kuala Lumpur press conference, that the state government had put a stop to the feasibility study was a “miscommunication”. “I did mention [it] but [it was a miscommunication] … maybe because it is the fasting month. I am also inviting some members of the press in the future to China to see what China Railway [Construction Co Ltd] has done with the undersea tunnel over there. Why would I do that if the tunnel project has been stopped? “We have completed 83% of the feasibility study for the tunnel, and we intend to fully complete the study in a matter of six months. We have good consultants looking into it and it is definitely feasible,” he told a packed news conference here chaired by Penang Chief Minister Lim Guan Eng. Guan Eng reiterated that no payment will be made by the state government to CZBUCG, the main contractor for the tunnel, if the detailed environmental impact assessment (DEIA) of the project is not approved by the Department of Environment. “Even if the feasibility study for the tunnel, which forms a part of the DEIA, is completed but approval for DEIA is not received for the tunnel, the project cannot proceed and the contractor cannot claim compensation from the state government,” he said. The preliminary process for the tunnel involves a feasibility study, detailed design work and then the DEIA. The undersea tunnel, said Guan Eng, would most likely be completed in 2027. “The feasibility study could also be applied towards the construction of a third bridge [instead of a tunnel], if the federal government is willing to approve that, it will be much cheaper to build a bridge and we will make it a no-toll bridge,” he said. CZBUCG, which consists of Zenith Construction Sdn Bhd, Beijing Urban Construction Group Co Ltd, Sri Tinggi Sdn Bhd and Juteras Sdn Bhd, was awarded the RM6.341 billion project by the Penang government in 2013. China Railway is its engineering, procurement and construction contractor. The project comprises the construction of three highways — a 4.2km bypass from Gurney Drive to Lebuhraya Tun Dr Lim Chong Eu, a 4.6km bypass between Lebuhraya Tun Dr Lim Chong Eu and Bandar Baru Air Itam, and a 12km paired road from Jalan Tanjung Bungah to Teluk Bahang — and the 7.2km undersea tunnel. Zarul Ahmad said CZBUCG’s priority now is the construction of the three highways.